I am a fierce critic of Republican Majority leader Senator Mitch McConnell (R-KY). He is a ridiculously ineffective "leader" (if such a term can be even loosely associated with him). He is unwilling to use the power of his office to advance any Republican concepts. He is outright hostile to Conservative viewpoints. He is the epitome of an "Establishment Republican." Today, Sen. Surrender waived the white flag yet again. How unexpected. The Senate today held a "procedural" vote on if it should "de-fund" Planned Parenthood. The vote was for the purposes of advancing the bill to the floor of the Senate for debate. The vote was held, and it was 53 "for" and 46 "against." Now, under the arcane rules of the Senate, 60 votes are required to overcome something called a "filibuster," which is a fancy way of saying "we've debated whether or not we're going to take up this bill for long enough." Basically 60 of the 100 members of the Senate have to say "we've debated if we're going to take up this bill long enough" in order to actually "move" the bill to the floor and start debating the "merits" of the bill itself. The Democrat members of the Senate are TERRIFIED of having to actually debate the barbarism of Planned Parenthood dismembering babies and selling their body parts to the highest bidder (all in the name of "medical research" of course), as has been evidenced through multiple "undercover" videos released by the Center for Medical Progress. They know it's a losing proposition for them, as the voters who are ambivalent to abortion in the abstract will become horrified by the fact that their "tax dollars" are being used to dismember babies in the womb so that Planned Parenthood Of America can chase the almighty American dollar. The funny thing about a "filibuster" is that it USED to be that you actually, you know, had to TALK. Surrender McConnell seems to have "forgotten" that little tidbit of information, and is content to have the procedural vote, and then say "oh well, we tried, but those darned Democrat members just don't want to take this up. Let's take it up in the spending bills later." Good, ol' Surrender McConnell knows full well that he'll be waiving the white flag again in another month or two, when the Democrat members start jumping up and down screaming "Republican War On Women!!!!" and President "I've got a pen and a phone" Obama goes out and falsely claims "Republicans want to end health care for women." If McConnell had any, and I do mean ANY, Conservative chops at all, if he was even the tiniest bit not the Liberal RINO that we all know him to be, he would keep the Senate "in session" and make the Democrat members "stand" behind their "filibuster" until they simply CAN'T talk anymore and then hold another vote to move the bill onto the floor, where it would pass OVERWHELMINGLY. Even the most PROGRESSIVE LIBERAL knows that voting to give $500 Million to Planned Parenthood for dismembering babies to sell their body parts is a one-way ticket to retirement in the next election cycle. So good job "Surrender" McConnell. Maybe this can be the final tipping point that shows that due to your cowardice you don't deserve the leadership role entrusted to you by your peers. Because Democrat Elected Officials Engage In Public Corruption When They Are Supposed To Be Fighting Public Corruption. Background: The elected District Attorney of Travis County, where Austin, the capital of Texas, is located is the head of the "Public Integrity Unit" of the state. This "Public Integrity Unit" has taken it upon itself to be the policing arm of ALL elected officials in the State of Texas, when Democrat Ronnie Earle was the elected DA in Travis County. DA Earle promptly started attempting to go after Republicans, wielding the power of his office as a cudgel for political purposes, culminating in the indictment of Rep. Tom Delay, who was charged with something that was not a crime at the time he performed the act. The current occupant of the office, DA Rosemary Lehmberg continued the partisan actions of attacking Republicans she thought she could get away with. However, she is also a raging drunk. One night, she decided to get into her car after getting to almost 3x the legal alcohol driving limit, and she got caught. She promptly attempted to get the Sheriff's Department to call "Greg" (Hamilton, the elected Sheriff) of Travis County. When told that she had been arrested for Drunk Driving, she told the Sheriff's department employees "well, that's you're all's problem." The implication is clear: Give me special treatment because I know your boss. When the head of the Public Integrity Unit refuses to resign after engaging in an attempt to subvert justice because of her position, it's time to disband that office. 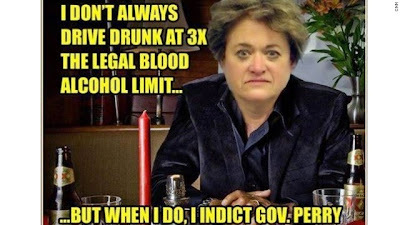 Governor Rick Perry had every right to use his line item veto to remove funding for the public corruption actions of the office, when the head of that office herself attempted to engage in public corruption to save her own skin. When you distil it down to it's most basic analysis, the following comment from Tom Swift at Legal Insurrection is one of the most insightful comments on the development of civilization that I have ever seen, because in a mere few lines, it actually explains the economics of civilization in a way that can be understood by those who have not spent extensive time studying economics. Civilization exists because we need masses of goods. Plan or no plan, the need was always there. Otherwise, we’d still be hunter/gatherers. First it was just food. If you need a steady supply of food, farming becomes inevitable. Then you need irrigation, which requires organized labor [working as a group]; and walls, so your livestock doesn’t wander off, and that’s the start of architecture. Then you need defense, so that your neighbors, who aren’t so good at organized labor, don’t move in and steal your crops and animals or, worse, appropriate your irrigated farmland and your stockades. Then, because you spend your day farming and are too busy to develop weapons for defense, you trade [with] some of your other neighbors some of your food for some of their weapons, and suddenly, you have a trade economy. The great triumph of civilization is not religion, or science, or art; it is cheap food, and everything needed to produce, transport, and supply it. It may be hard for European intellectuals or “back to nature” Greenies to admit it, but the acme, the supreme achievement of civilization, the fulfillment of an age-long dream, is … McDonalds. Iran gets the gold mine, Israel gets the shaft. Likely the worst possible outcome has been achieved by the supposed Geneva Nuclear Negotiations regarding Iranian enrichment. It does nearly nothing to degrade Iran's current capabilities, has weak enforcement mechanisms, and largely does not put in place any barriers to stop an Iranian sprint toward a nuclear weapon (aka "breakout capability" if such capability has not already been achieved. Let's look at the big points: It allows Iran to retain HALF of it's working stock of 20% Oxide for fabrication of fuel. Like that's going to be used for "fuel" without being diverted. Right. The next point, that Iran won't enrich uranium over 5% for the duration of the 6 month interim agreement is rendered meaningless by this, because they're already the vast majority of the way to nuclear grade material. No further advances of activities at Natanz, Fordow or on the Arak (plutonium) reactor? Doesn't matter. They've already got sufficient capability to enrich to 90% in a matter of weeks for at least 6 nuclear devices. That initial nuclear deterrent is all they need to buy them time to avoid a ground assault against their production facilities. The footnotes about enrichment are equally unappealing, as they allow Iran to "replace" centrifuges, and keep the centrifuge cascades already in place without degrading their ability to produce, even if 12 cascades are currently in an non-operative state. That can be changed on a VERY short notice. Iran gets to CONTINUE R&D practices which are "not designed for accumulation of the enriched uranium." Oh really? There's an awful LOT you can learn about a process by doing things "similar" to that process, and a whole bunch of "dual use" technology to develop out there. No "new" locations for the enrichment. Are we REALLY sure that we know about all the "current" ones? My guess is no. No reprocessing or construction of a facility capable of reprocessing? "Unannounced" inspections and daily IAEA inspector access when not present for basically other purposes at Fordow and Natanz. Anybody who's been paying attention knows that these are the Iranian "showroom" floor. The real heavy work is being done at military hardened "black sites." However, there will only be "managed access" to the centrifuge assembly workshops, centrifuge rotor production workshops and storage facilities, and uranium mines and mills." This means that if the Iranians want to hide their true progress, they just need to properly direct the IAEA Inspectors away from the workshops and storage of "sensitive" items, and there will be no easy way to confirm any "off the books" mining and production milling. So what does Iran get in return? No new UN or US administration nuclear related sanctions, plus a "financial channel" for oil revenues to facilitate humanitarian trade (food, medicine, medical devices and medical expenses), and payment for UN obligations and Iranian student college tuition for students abroad. A "pause" of efforts to further reduce Iran's crude oil sales, allowing Iran's "current" customers to purchase their current "average" amounts of crude oil, and enable "repatriation" of an agreed amount of revenue held abroad. What this means is basically Iran gets to bring back a certain amount of money held overseas that has been held up by international sanctions, which Iran can then infuse into its economy. That infusion will go a LONG way toward mollifying the most "radical elements" of the Iranian Republic, aka the young who are openly rebelling against the clerical establishment, and who are the ONLY hope of reforming the Iranian government. Iran gets its sanctions on Oil exports and associated services and gold & precious metals, as well as associated services lifted. Let's see, exactly how much gold does Iran have in it's national stockpile? Well, at least as of 2011, Iran was holding as much gold as the United Kingdom, and was purchasing more. That amount was estimated at above 300 tons of gold at that time (approximate value in today's US dollars: about $12 BILLION dollars ($11,932,800,000 = $1,243 per oz x 16 oz per pound x 2,000 pounds per ton x 300). Again, that is assuming that we know of ALL the gold that they have purchased and were holding. Suspension of sanctions on Iran's auto industry and licensing of parts for Iranian civil aviation. Cars are an important piece of life, and planes allow for people to get from place to place easily. So what does this buy the Iranians? Time. I've done enough negotiations to be able to recognize when the other party is stalling because they think that their current project or income stream will change the equation of the negotiation, or that the other party's negotiation strength will be diminished, damaged or destroyed by some delay. The Iranians are really, REALLY close to having a functional nuclear weapon. If they can run out the clock to get hold of one, that will be the end of trying to keep them from joining the "nuclear club." Further, the deal explicitly lays the groundwork for recognizing a future Iranian "mutually defined enrichment programme with mutually agreed parameters consistent with practical-needs, with agreed limits on scope and level of enrichment activities, capacity, where it is carried out, and stocks of enriched uranium for a period to be agreed upon." Notice that last little bit: not permanently, but for an agreed period of time. The Iranians learned the nuclear lessons of India, Pakistan and North Korea well: delay, obfuscate, make token concessions and then withdraw them at times that it suits you to do so, while continuing to work in the background toward the ultimate goal of a nuclear weapons program sufficient to head off any sort of localized ground invasion, as well as leverage to use against any country as a "massive retaliation" option for interference in domestic affairs. Once you do that, effectively you become untouchable as a nation from any sort of major outside governmental change. If you can then repress your own people sufficiently to prevent revolution, you have ensured your continued power base so long as you can maintain your ideology. At this point, there is really only one hope to prevent a nuclear weapon possessing Iran: an Israeli strike. If the Israeli's get any indication that Iran has finished a nuclear weapon, expect a short, brutal and very effective attack by Israel upon Iran which will take out a significant swath of the Iran's military assets. Let us hope that Israel has the stomach for such an action. The cowardice of Obama Administration officials, from President Obama and Sec. Kerry on down has show that the current US administration does not. Let's play a version of "Where's Waldo." What's wrong with the following two pictures? Can't figure it out? This was at the protest of the "Right To Work" legislation that was just passed by the Michigan Legislature and is about to be signed by Gov. Snyder. Look at the upper left hand corner. Somebody's holding a sign that reads "I support Planned Parenthood. Keep abortion legal." I think somebody was at the wrong protest. Either that, or the protesters hired some uneducated sap to carry a protest sign and they handed out the wrong one, which has happened before at some of these "Labor" movement protests. These Union Bosses REALLY need to get higher standards for the day laborers who they hire to work these protests. What's wrong with this picture, you might ask? Look VERY carefully at the top sticker in the center on this guy's helmet. He's protesting IN THE WRONG STATE. 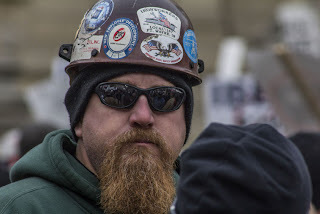 He belongs to Iron Workers Local 147 from FORT WAYNE INDIANA. 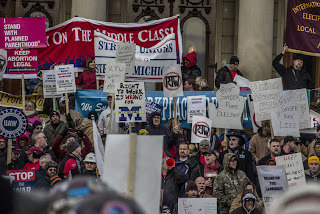 Now it's one thing if the Union Thugs decide to bus in Union Thug members from around Michigan. But it REALLY says something when you're in a state where 17.5% of the population is unionized that you have to swell your ranks by busing in Union Thugs from OTHER states just to make your protest look bigger. Here come those layoffs that the Liberals voted for Tuesday night by re-electing Obama. Don't EVER say that it was unexpected or that you didn't know. We Conservatives have been telling anyone who would listen, and often nearly empty rooms if few people showed up that these employment losses were coming due to Obama Policies. So if you're an employee of one of the companies listed below and you're laid off, thank a Liberal, because they're the ones who cost you your job. UBS Bank announces it will lay off 10,000 employees. Hawker Beechcraft Inc. will close it's private jet plant and lay off 280 employees in Arkansas and close facilities in Mesa, AZ., and San Antonio. Boeing is laying off 30% of its management, closing facilities in California and consolidating other facilities in order to "cut costs." Research In Motion announces US layoffs and moves operations to Canada. US Cellular announces urgent reduction in employee ahead of end of quarter close. Commerzbank lays off employees and closes operations. ING Co. files public notification of layoffs. Ericsson announces reductions to labor force in advance of Obamacare implementation. Kroger Supermarket chain eliminates Full Time jobs and reduces hours for all employees. Bristol-Myers sends lay-off notices to employees. Corning Co. presents reduction in labor force plan. Abbots Labs reveals plans to reduce labor operations ahead of Obamacare implementation. Caterpillar announces plant closures and permanent layoff plans. Welch Allyn will lay off 275 employees over the next 3 years due to the Medical Device Tax included in Obamacare. DANA Holding has announced layoffs (but not yet detailed their extent). Stryker (medical device maker) has already laid off 96 employees and plans to cut their global workforce by another 5% (almost 1200 employees). Medtronic already has cut 500, and plans to cut another 500 by end of 2013. These are just the announcements that have been made in the 48 or so HOURS since Obama was declared the winner. Imagine what is going to happen over the next THREE MONTHS as businesses finally wake up to the actual costs about to be imposed upon them. The future big hitter: Darden Restaurants (owners of Red Lobster, Olive Garden, Longhorn Steakhouse and more) will be limiting the hours of its employees to 28 to limit the number of "full time" staff. Darden currently offers a "limited" health care plan to its employees which will be eliminated by Obamacare. Darden employs 185,000 employees. 1/4 of them are currently full time and will have their hours slashed (that's 46,250 people folks). So when the Obama folks trot themselves out and say "well, NOBODY could have known it was this bad, and we're still recovering, just remember, we warned you. We begged and pleaded with you to open your eyes and see the economic damage being wrought by the Marxist and Redistributionist policies of President Obama and his Administration. But don't ever, EVER claim that we didn't warn you. Well, Ohio, you're about to get the government you deserve. Don't come crying to the Federal Government when you're facing 20% unemployment because Obama closed all your coal mines and won't let you exploit your Natural Gas resource that you're sitting on top of. Cuyahoga and Franklin Counties, when the next set of riots comes because your African American population can't find jobs and are starving due to a 30+% unemployment rate (because it IS coming), you're on your own. Pennsylvania, you're in the same boat. Montgomery, Delaware, Allegheny and Philadelphia counties, you had the opportunity to defeat a president which is costing your state TENS of THOUSANDS of jobs due to the energy resources that you are literally standing upon. President "I'm going to bankrupt coal" has destroyed your economy. When rioting comes to Philadelphia, don't look to us to save you. We're going to let the "City of Brotherly Love" burn to the ground so that you understand exactly the cost of what you voted for. Additionally, the fraud in the Philadelphia area and the uncontested voter suppression by Leftist, Marxist, and Black Power groups such as the Black Panthers show that Philadelphia deserves to become the war zone it will become when the Federal Government can no longer provide the steady drug of "safety net" payments and your people start to starve because they have no skills other than to suckle upon the government teat. Florida, I honestly thought better of you. You would think that your Jewish population ALONE would have been sufficient to carry the state against someone who is proposing policies to make Israel so indefensible that, if implemented, it would be destroyed by the forces of darkness at its door. Fortunately currently Israel has a government sufficiently strong as to withstand those "suggestions" by the Obama Administration. You people of Miami-Dade, Broward and Palm Beach counties, when the next hurricane comes, and there is looting and death and destruction on the streets, do not cry out to the National Guard and Federal Government to save you. Nay, since Obama has spent us into oblivion on foolish adventures in economic tinkering both large and small, we have no funds to help you. You're on your own. Similarly you Social Security retirees, when that day comes when Obama holds out his pockets and says "we have no more money to pay you for living," do not cry out for the people to support you in your infirmity, for we shall say "you had the opportunity to elect someone who would have fixed the problem, you voted against your interest and now you have to suffer the consequences." Finally, to all you members of the 47% who voted to continue your free ride upon the few individuals of the United States who are doing the hard work to pay for the nation, know that your time is almost up. You can only take and take and take from those who are actually producing wealth for so long before they say "I'm not going to produce any more." Greece is what our future looks like, complete with riots in the streets and promises broken. You had this ONE chance, this ONE opportunity to forestall and divert us from that path. You chose to continue to eat like pigs at the trough of government largess. Those you call "the rich" will not much longer tolerate your free-ridership. They will take their wealth and instead of investing it into the creation of wealth and a better life for themselves and their children, will merely consume it themselves and say "to hell with everything, rather than have my hard work and personal property confiscated, I'm going to enjoy it myself." So, people of Ohio, Pennsylvania and Florida (and Virginia too), we as a nation are all about to suffer under the government you deserve. Perhaps the pain of the next four years to come will teach you the object lesson that you so richly deserve.